Stony Creek Metropark The Metro Detroit area is roughly bordered by Huron River to the south and west, and Clinton River to the northeast. Following these rivers and including Southeast Michigan's five major counties, Wayne, Oakland, Macombe, Livingston, and Washtenaw, a park system provides recreation opportunities year-round. The Huron-Clinton Metropolitan Authority was created in 1940 to provide residents of Southeast Michigan opportunities to enjoy the outdoors within a relatively short driving distance. To this end, thirteen Metroparks were developed and serve to protect the area's natural resources. 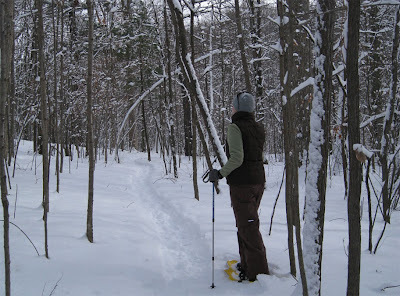 The HCMA believe their efforts “are guided by the belief that the use of parks and exposure to natural environments enhance society's health and quality of life.” I was very happy to discover the existence of this park system a few years ago, primarily for winter activities. 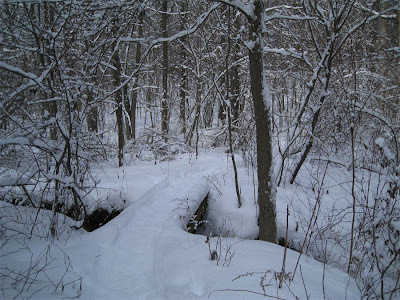 This part of Michigan typically doesn't receive a large amount of snow (so far this season is proving to be a wonderful exception), but when a storm does comes through and blankets the region with a nice layer of fresh white powder, it's great to have a few decent trails within an hour's drive. So far I have only explored two of the Metroparks, Kensington and Stony Creek, which also happen to be the largest at over 4300 acres each. 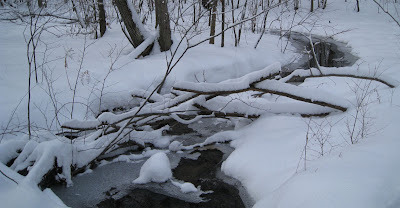 Last Sunday, following a whopper of a snowstorm that lasted the entire day before, I drove to Stony Creek Metropark in northern Oakland County with my snowshoes, camera, camelbak, and, of course, kleenex. It's such a bummer to forget that cold air makes the nose run and not come prepared. 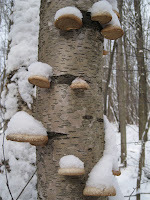 After paying the $4 entrance fee, I drove north very slowly on the snow-covered road that winds through the park past a golf course to the west (presently used for cross-country skiing), a fitness trail, and several designated picnic areas along the east shore of Stony Creek Lake. The lake is fed by Stony Creek and has three distinct segments; the southernmost is the largest and the center of activity at the park. The middle section hosts a few stray picnic areas, and the northern section exists within a quiet nature study area where activity is limited to hiking or mountain biking. This was my destination. The nature center at Stony Creek provides interpretive displays showcasing the area's natural points of interest and is home base for a handful of trails that wind through this section of the park. I chose the East Lake Trail which is a small network of four connected trails along the eastern shore of Upper Stony Creek Lake. On the western shore, Osprey Trail loops through an area which was part of an osprey re-introduction program that began in the late 90's. Because of the heavy snowfall the previous day, the mixed forest surrounding Stony Creek was so serene that I couldn't help but smile as I looked around. I thought I would stumble upon the secret entrance to Narnia at any moment. 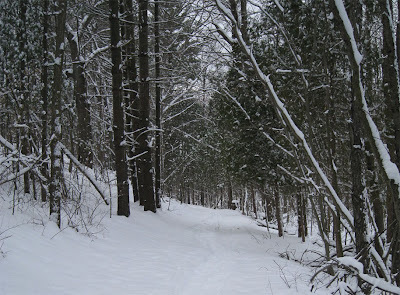 I spent a very peaceful two to three hours walking through the arresting winter woods. The trail loop is only around 3 miles long, but when practically everything I see begs to be photographed, progress tends to be very slow. I am very much looking forward to exploring more of the trails within the Metroparks in my area. As I write this, another day's worth of snow is accumulating outside making this weekend another prime opportunity. I am always amazed at the trees in Michigan. I think I would get lost in there. 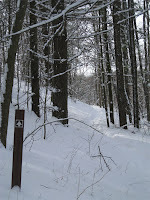 We discovered a new trail this last weekend that I will blog in the near future. 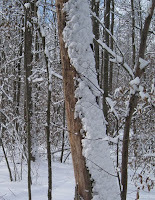 Great post about the Metroparks. I love your reference to finding Narnia. Yes, it really does look that way in some places, doesn't it? I never thought about it before you wrote it. Now I'll be looking for them! How crazy that this is around Detroit! This new snow should make for some great snowshoeing tomorrow morning! Great story, and so close to home. This has gotten me very excited to try out my new snowshoes that I just got for Christmas, and spend some winter time outdoors with my daughter. Just waiting for the next big dump of snow since the recent thaw day we just had. Thanks.